On tour of Wild Atlantic way. Dingle with my Wisconsin ladies. Yesterday, Thursday, was our day on the Ring of Kerry but today our destination was the magical Dingle Peninsula. What a beautiful day we were blessed with, as the sun shone all day and the air was cool and fresh. Our first stop was at the beautiful beach at Inch, and here we have the ladies, sitting on the low wall, with the blue waters of Dingle Bay and the Atlantic in the background. From the left, we have Jenny, Kathy, Rose and Jeanette. Mom, with her two baby girls, Kathy and Jenny. How they love their Mom. All together again, from the left, Kathy, Rose, Jenny and Mom Jeanette. Inside one of the beehive huts in Dingle. A very special moment for Rose as Jenny feeds the baby lamb while Rose holds her. Kathy also had her turn to hold another baby lamb. Sitting in the sun near Slea Head. One of my favourite scenes near Slea Head. This ruin of a old home, that of a sheep farming deep sea fishing family and overlooking the Blasket Islands. What a lovely picture of Kathy and Jenny, at Slea Head, with the Blasket Islands in the background. Another wonderful picture of the rugged Atlantic coastline on the Dingle circuit. A framed picture of the lovely Kathy. She was not expecting this HaHa. 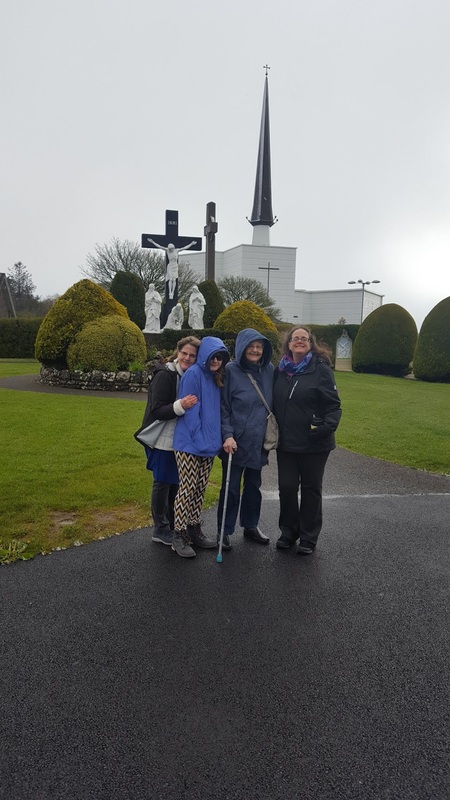 Our final photo today was at the top of the Conor Pass ,with Kathy, Jeanette, and Jenny, loving every minute of their tour. This turned out to be a really special day and one that we all loved. A very special picture to complete a special day, the scene of the crucifiction at Slea Head. My four lovely ladies from Wisconsin. My latest tour began in Dublin on Monday when my new party were collected by Elva my driver guide and transported to Galway where they stayed on Monday night. They were lovely from the word go and got along with Elva straight away. Elva is my latest addition to my driver guides and is fully qualified both as driver and guide. She is great fun and loves her work. Tomorrow is our visit to Knock. 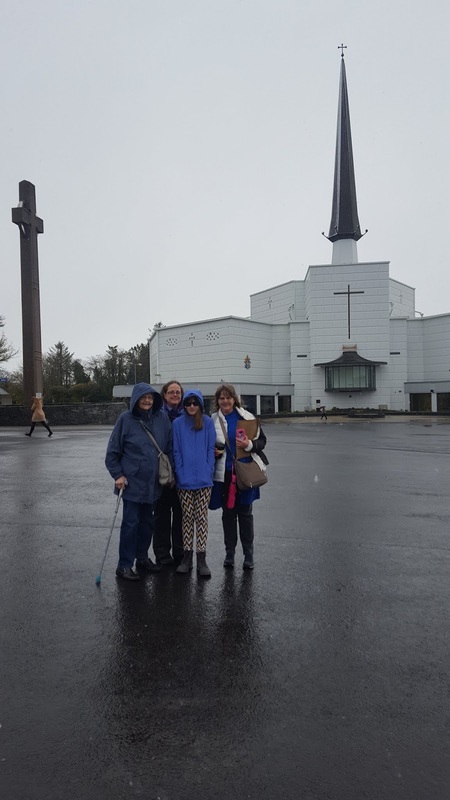 All wrapped up, and trying to stay warm at Knock. In the background we have the stations of the cross and the spire of the Basilica. From the left, we have Jenny, Rose, Jeanette and Kathy. Believe it or not, it was actually snowing when i took these photos. From the left, Jeanette, Jenny, Rose and Kathy. 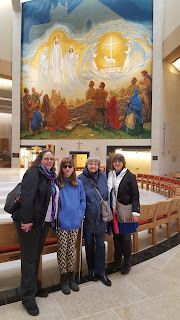 Inside the basilica, in front of the wonderful mosaic depicting the apparition. From the left, Jenny, Rose, Jeanette, and Kathy. In out of the cold, and enjoying a lunch break at the museum restaurant in Knock. The vacant chair nearest the camera was yours truly. Nobody dared to touch my bacon and cabbage and mash. Jeanette and Kathy also had the same, while Jenny had a wrap, and Rose had a ham and cheese sandwich, and chips (our french fries). It was all really nice, and more than welcome. 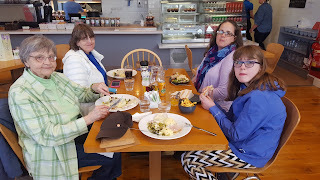 This was a lovely visit today and i really enjoyed the company of these lovey ladies, and am excited about journeying south with them to the peninsula areas over the coming days.